In September, Cloudberry, attended NHS Expo 15 in Manchester as part of a two day event attended by over 10,000 delegates from health and care, the voluntary sector, local government, and health industry. A key feature of the event was highlighting the current Vanguard sites in the New Care Models Zone which included Dudley CCG, as well as, information on two other Midlands Vanguard sites: Solihull and Birmingham. 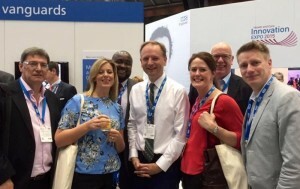 Simon Stevens, Head of NHS, with some of the team driving the Integrated Care agenda in Dudley including: Dudley CCG, Dudley CVS, Dudley MBC and Cloudberry. 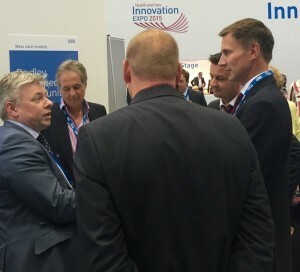 Cloudberry, Dudley CVS and Dudley CCG presented the innovative work that is taking place in Dudley around Integrated Care, including locally developed outcomes CRM, PSIAMS, to a range of attendees including Jeremy Hunt, Secretary of State for Health and Simon Stevens, Head of NHS England.